This project aims to increase the resilience from climate change impacts by restoring endangered coral reefs ecosystems and protecting poor and vulnerable communities in Indonesian cities. The project titled: “Restoring Nature, Protecting People: Coral reefs restoration as social protection and nature-based adaptation to climate change”, hereafter RESPRO Project. The RESPRO Project will be implemented by Climate Change Center (C3), Indonesia for 12 months at coastal areas with engagement by local communities in Semarang and Bandar Lampung city, Indonesia. Three key milestones of this project include: (1) Research for adaptive coral reefs, (2) Ecosystem management and restoration of coral reefs, and (3) Community livelihoods and participation. Worldwide, coral reefs ecosystems have deprived as impacts of climate change and local stressors (Hoegh-Guldberg et al, 2007). Developing adaptive coral reefs will significantly mitigate risks from climate change and enhance the resilience of both natural ecosystems of coral reefs and coastal communities. For economic reason, Ferrario et al (2014, p.3) has calculated that “the costs of the restoration projects were significantly cheaper than costs of building tropical breakwaters.” Coral reefs also provide habitat for marine biotic, in which fisherman’s livelihoods will depend on its healthy ecosystems. More significantly, Indonesia is one of the highest countries of risk with approximated distance of number of people living <10 meter elevation and <10km from reefs (Ferrario et al, 2014). Low elevation coastal urban areas and small islands such as coral atolls are among key hotspots of societal vulnerability in Asian cities, such as Indonesia coastal cities (IPCC WGII, 2007). Restoration of coral reefs will not only benefits economically but thoroughly contributes to environmental sustainability, coastline protection and marine livelihoods. This project focuses on Absorb capacity of coral reefs ecosystems and local communities livelihoods interventions. The UN defines absorb capacity as “the capacity to absorb shocks by increasing access to insurance and risk transfer pools (insurance) and social protection risk reduction practices and technologies.” This capacity is significantly essential to enhance climate resilience and social protection of local communities. Climate change has already affected the coral reefs (IPCC, 2014; Hoegh-Guldberg et al, 2007). It was reported that due to global warming and ocean acidification, the potentials livelihoods impacts are including coral bleaching, disrupted fish species distribution and threaten catch potential for coastal communities and fishery jobs (Hallegate et al, 2016; Mearns and Norton, 2010). Climate change impacts have also affected the coastal ecosystems and livelihoods of coastal communities in Indonesia, especially in northern part of Java Island and southern part of Sumatera Island. Semarang and Bandar Lampung are two of secondary cities that actively undertake adaptation planning and actions to anticipate these climate change risks. The Vulnerability Assessment conducted as part of the Asian Cities Climate Change Resilience Network (ACCCRN) in both cities mentioned that fisherman and coastal communities are identified as among the most vulnerable groups due to climate change (ACCCRN, 2010a and ACCCRN, 2010b). ACCCRN is a multi-year and multi-countries programme (see here: www.acccrn.net), initially being implemented in 10 cities 4 countries – now expanding to 40 cities including Bangladesh and Philippines. ACCCRN aims “to catalyze attention, additional funding and action on building climate change resilience at cities as a whole – and within that ensuring that the resilience of vulnerable and poor communities is also enhanced.” (Brown et al, 2012, p.532). As part of ACCCRN programme in building urban climate change resilience, both cities have undertaken Vulnerability Assessments, planned City Resilience Strategies and mainstreamed it into City Development Plans. However with limited financial resources and technologies, they need to understand how climate change adaptation can contribute to build effectively to enhance climate resilience and provide social protection for coastal communities. The first milestone focuses on researching adaptive coral reefs. The project activities involve field observation and monitoring of sustained coral reefs under climate change and local stressors. It was estimated that only 10 – 15% of coral reefs ecosystems remain in Bandar Lampung, but there is high uncertainty on its current conditions. With rising temperature, a few coral reefs might still be tolerant and adaptable to climate change, such as Porites, Montipora and Acropora. The field observation is defined to measure and monitor ecological resilience from local coral reefs and its natural habitat. Continuous monitoring will be undertaken throughout the project implementation. The second milestone focuses on ecosystem management and restoration of coral reefs ecosystems. Ecosystem management is defined as “an approach that attempts to involve all stakeholders in defining sustainable alternatives for the interactions of people and the environments in which they live.” (Szaro et al, 1998) It focuses on place-based objectives, ecosystem-based approach and human-environment interactions (Szaro et al, 1998). This is particularly important, as climate change will impact across varies scales, beyond administrative boundary and organizations. Using an ecosystem management approach, the project will approach to build a cross-jurisdictional network, undertake coral reefs restoration and knowledge management. This project follows the premise of human-environment interactions within city’s institutions, agents and ecological system. The project aims to build a foundation for a goal-driven, collaborative and shared-visions approach for restoring and sustaining healthy coral reefs ecosystem, which will integrate ecological, economic and social factors (Szaro et al, 1998). The third milestone focuses on community participation with involvement from poor and vulnerable communities and to support for their marine livelihoods in both cities. The project activities involve the capacity building and engagement from local communities in both coastal cities. The capacity building includes awareness of climate change and its impacts, coral reefs restoration and sustainable livelihoods. Community peer-learning will include knowledge sharing, cross-learning and best practices for sustainable coastal management and coral reefs restoration. Since 1997, Mitra Bentala has actively undertaking conservation at coastal and small islands, including in Pahawang Island, Legundi Island, Tegal Island and Panjang Sub-district at the southern part of Sumatera Island. Prenjak Community Group has also actively undertaken mangrove reforestation and sustainable tourism activities in northern part of Java Island. The idea of community peer learning in this project is to build, exchange and accumulate shared knowledge across coastal communities and cross-learning. Community outreach includes creative public communication, local community meetings and publications. Climate Change Center (C3), Indonesia will lead the overall management of this RESPRO project implementation. C3 is a non-government organisation (NGO) registered as a charity entity in Indonesia. Since 2009, C3 has engaged and experienced with community and youth participation in climate change mitigation and adaptation in Indonesia. Its programme includes Berbuka Sambil Ingat Lingkungan (Break Fasting while Remembering the Nature), West Java Youth Climate Friends and several environmental awareness training. For this project, C3 will collaborate with Genetic and Biology Molecular Laboratory at Bandung Institute of Technology (ITB) for coral reefs research, and NGO Prenjak Community Group in Semarang and NGO Mitra Bentala in Bandar Lampung for ensuring local implementation, active participation and engage widely with the poor and vulnerable groups in both cities. At city level, the project team will maintain coordination with Coordinating Team for Urban Climate Change Resilience in Bandar Lampung, and Chief Resilience Officers of Semarang city. The project is supervised by Mr Danial, ST, who is the chair and Mr Jalu Priambodo, ST who is the co-chair of Climate Change Center (C3). For the daily management of this project, Ms Feraliana, S.Si, M.Si was appointed as the project manager for RESPRO Project who is responsible for planning, managing and ensuring the delivery of project milestones and activities. The whole management team is to be set up for the overall management of the project, including project officers, lead scientist, and finance and project administrator. The location for this project is in Semarang and Bandar Lampung city, Indonesia. Coral reefs ecosystems in both cities have deprived reefs due to climate change and local stressors. Both cities also have a high number of poor and vulnerable communities and fisherman who relies on fishery productions and marine livelihoods. In total, there are 2,659 fishermen in Semarang (BAPPEDA and BPS, 2015). Bandar Lampung city, Indonesia: Panjang Selatan sub-district and Kubur Island. Kubur Island is dedicated zone for mangrove and reefs conservation under Coastal Strategic Plan by the Government of Bandar Lampung. The key benefits are two-fold: nature restoration and social protection. Using research and ecosystem management approach, the project aims to benefits not only from the restoration of deprived coral reefs ecosystem but also from the project integration with ecological, economic and social factors. Coral reefs ecosystems in Lampung Bay have a significant contribution to marine production, which estimated 1,600 fishery sites, depends on coral reef’s (Lampung Province Government, 2000). As climate change will impacts not only in short-term but also a longer term which include 50-100 years, building the resilience of coastal communities from climate change will require sustainable coral reefs restoration. This project aims to achieve a beneficial integrative outcome by restoring coral reefs ecosystems, increasing ecological resilience and providing social protection through ecosystem management, coastline protection and marine livelihoods. The estimated total cost for this project is 52,000 euros. Project implementation, which includes ecosystem management, restoration of coral reefs ecosystem, livelihoods development and community participation. Besides this grant, Climate Change Center (C3) is also looking for any opportunities for collaborative work and supporting funds to implement the project widely in both cities. This proposal will be shared to prospective donors in order to accumulate resources for its implementation, including to actively approach some global, regional and national climate funding streams as follows: (1) Adaptation Fund (AF), (2) Green Climate Fund (GCF), (3) Wallace Global Fund, (4) The Asia Foundation Grants, and (5) Indonesia Climate Change Trust Fund (ICCTF). As the project will engage with the environment and human systems, it will carefully and comprehensively assess its environmental impacts and risks for maladaptation. Risk assessment is the key initial measurement for mitigating both risks at the beginning of the project. The project will also apply Environment Sustainability and Do No Harm principles. The sustainability of this project and its post-activities will be defined by the effectiveness of coral reefs restoration, its adaptive capacity to climate change and social protection. Its success will need to be defined as short-term and long-term. At short-term, the project success is defined by its accomplishment to deliver project deliveries, successful coral reefs restoration and community livelihoods and participation. However in long-term, the project success is defined by its environmental sustainability, ecological resilience and social protection. Adger et al (2015) mentioned the complexity of successful adaptation involves spatial, temporal and societal scales of adaptations actions that this project will consider thoroughly. Within the project period of 12 months, it aims to build a strong foundation for achieving its long-term successfulness and effectiveness of climate resilience and social protection. Which will involve preparing for a detailed Project Implementation Plan (PIP) including Risk Assessment, team orientation and networking, and logistics preparation. Period: month 1-2nd for the duration of 2 months. Which will involve undertaking field observation, laboratory tests and monitoring. Period: month 2-12th for the duration of 11 months. Which will involve setting up cross-jurisdictional network, restoring coral reefs ecosystems and undertaking knowledge management. Period: month 7-12th for the duration of 6 months. Which will involve capacity building and engagement, community peer learning and livelihoods development. Period: month 4-12th for the duration of 8 months. No related proposals in relation or in conjunction with this project. ACCCRN. 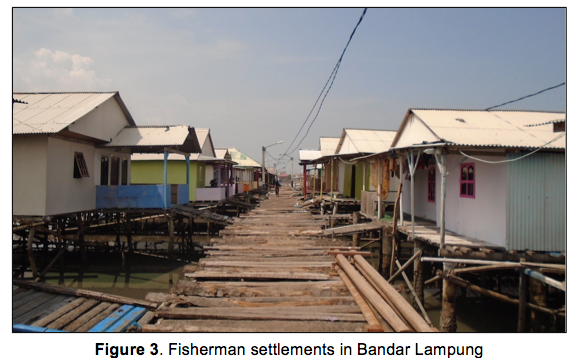 (2010a) Community-based vulnerability assessment – Bandar Lampung, Indonesia. ACCCRN: Jakarta. ACCCRN. (2010b) Community-based vulnerability assessment – Semarang, Indonesia. ACCCRN: Jakarta. Adger, W.N., Arnell, N.W., Tompkins, E.L. 2005. Successful adaptation to climate change across scales. Global Environmental Change 15, 77-86. Badan Perencanaan Pembangunan Daerah (BAPPEDA) and Badan Pusat Statistik (BPS). (2015) Kota Semarang Dalam Angka 2014 (Semarang City in Figure 2014). BAPPEDA and BPS: Semarang. Barnett, J; and O’Neill, S. (2009) Maladaptation. Global Environmental Change, 20, p.211-213. Brown, A., Dayal, A., Del Rio, C.R. 2012. From practice to theory: emerging lessons from Asia for building urban climate resilience. Environment and Urbanization, 24 (2), p.531-556. Hallegate et al. (2016). Shock waves: Managing the impacts of climate change on poverty. World Bank Group: Washington. Hoegh-Guldberg et al. (2007) Coral reefs under rapid climate change and ocean acidification. Science, 318, p.1737-1742. Intergovernmental Panel on Climate Change (IPCC). (2007). IPCC, 2007: summary for policymakers. In: Parry, M.L., et al (eds). Climate change 2007: Impacts, adaptation and vulnerability: Contribution of working group II to the Fourth Assessment Report of the Intergovernmental Panel on Climate Change. Cambridge University Press, pp.7-22. Intergovernmental Panel on Climate Change (IPCC). (2014). Climate Change 2014: Synthesis Report. Contribution of Working Groups I, II and III to the Fifth Assessment Report of the Intergovernmental Panel on Climate Change [Core Writing Team, R.K. Pachauri and L.A. Meyer (eds.)]. IPCC, Geneva, Switzerland, 151 pp. Mearns, R., and Norton, A. (2010). Social dimensions of climate change: Equity and vulnerability in a warming world. World Bank: Washington. Pemerintah Daerah Provinsi Lampung (Lampung Province Government). (2000). Strategic Plan of Coastal Management in Lampung. Pemda Lampung: Lampung. Szaro et al. (1998) The emergence of ecosystem management as a tool for meeting people’s needs and sustaining ecosystems. Landscape and Urban Planning, 40, p.1-7.